Here's a giveaway for an iPad Mini - and it's open worldwide! 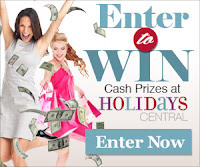 Enter below, then leave a comment. Thanks! 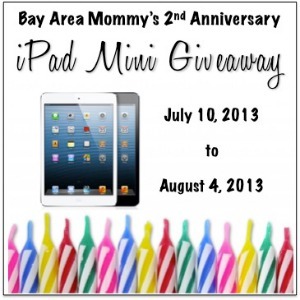 Welcome to Bay Area Mommy‘s 2nd anniversary iPad Mini Giveaway! Cohosted by Milk and Cuddles, Shortcut Saver, and Java John Z’s! One lucky reader will win an iPad Mini (winner’s choice of color)! Giveaway runs from July 10, 2013 at 12:01am EST through August 4, 2013 at 11:59pm EST. Open worldwide. Void where prohibited. Must be at least 18 years old to be eligible. No purchase necessary. Please see full terms in the widget below. To enter, use the GiveawayTools widget below. Good luck! Disclaimer: This blog is not responsible for prize fulfillment. For questions regarding this giveaway or if you notice errors in the links, please contact Bay Area Mommy at isis@bayareamommy.net. Thanks for the giveaway ! Hope to win and be lucky ! Giving such an offers is a very good thing other than sites where you make the users fool. Thank you for holding such an impressive giveaways. Good luck guys.